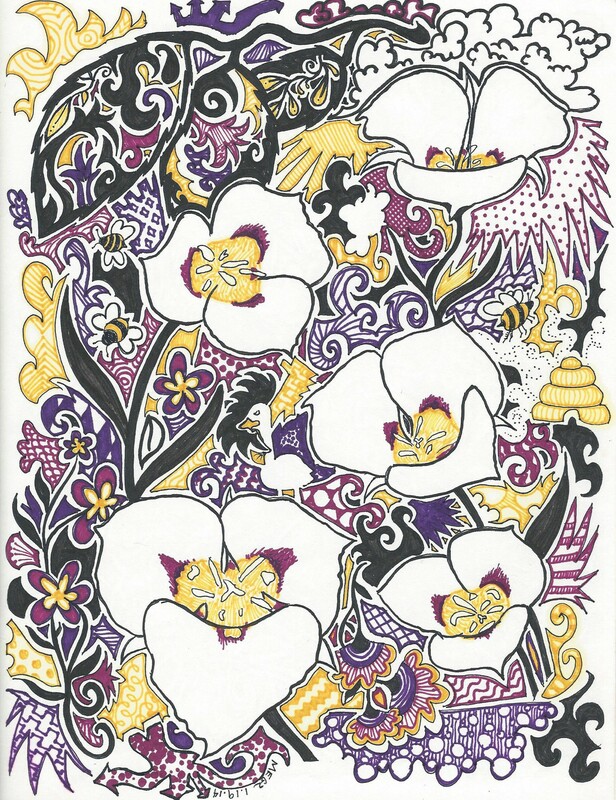 The next installment of state flower inspired doodles is Utah’s flower, the Sego Lily, after Colorado and Illinois, I’ve lived in Utah for the longest. I went to school there, had the most awesome job ever as a BYU operator, and enjoyed looking at the awesome Wasatch mountains. Apparently, the Sego lily was chosen as the state flower much like the Common Gull was chosen as the state bird; they both saved the early inhabitants from certain death. The flower provided an emergency food source, and the gulls ate invading locusts that were destroying crops. I’m still trying to master using negative space and color. Cool sego lilies. When I was a kid I’d see them in the fields as I would wander. More than once I tried to dig down to the bulb so that I could taste them. They must be a mile deep. I never succeeded. I love the colors. Megz, I love your doodles. They are so creative and fun. I know they could be marketed if we knew someone who had the proper connections. They are somewhat Beverly Dolittle-ish in the way you insert pictures within the picture.